Papworth was delighted to welcome Air Commodore Foale who is the father of NASA astronaut Michael Foale. His talk was based on his recent book “MIR, Michael and Me”. 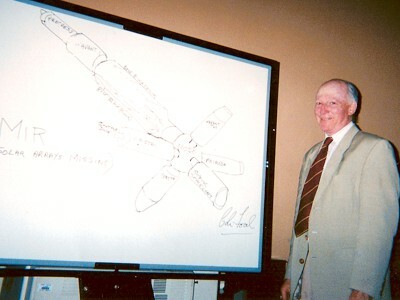 Using a drawing, Air Commodore Foale explained how the MIR Space Station was controlled and how in 1997 the station had major problems following a collision with a delivery craft. The routine of life on board the Space Station was also explained – eating, sleeping, exercising and performing scientific experiments. A lot of time is spent observing the Earth. Michael Foale has since been involved in servicing the Hubble Space Telescope. Approximately 30 people from Papworth and the surrounding villages attended the talk.